Lillestol Research opened as an independent research facility in 2004 dedicated to discovering treatment options and preventive measures for chronic and hereditary diseases. They currently have more than 20 employees and seamlessly operate an average of 40 clinical trials at any given time. 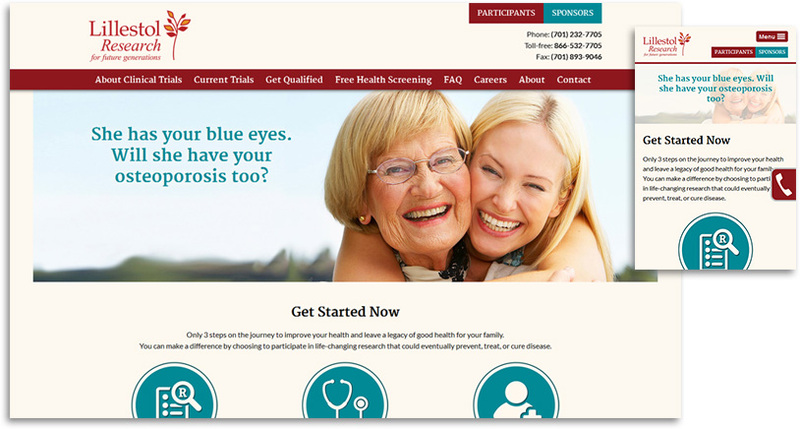 Lillestol Research was in need of a new site design layout that would tell a more complete narrative to both their participants and sponsors, highlight their clinical trials, and facilitate a more dynamic and fluid clinical trial sign up process. Ecliptic started by identifying the need for better data management. By pairing with our custom development division, we were able to create custom web application tools to assist with study and data management for Lillestol Research. We had the opportunity to partner with Charpentier Creative, who offered their expertise in content development and design to create the site design layout and narrative. Collaborating together, we were able to implement a modern, responsive design that incorporated an easy-to-follow participant and sponsor narrative with database management. Lillestol Research is a shining example of what true collaboration across all fronts can achieve.